Over the course of the year we've looked at many women of the Habsburg dynasty--the extended family that was one of the most important royal houses in western Europe. From their power base in Austria, the Habsburgs came to prominence in the thirteenth century as kings of the Romans, the title assumed by the men elected as king of the Germans. Habsburgs held the title of Holy Roman Emperor from the early fourteenth century until the middle of the eighteenth. They were also, at various times, kings, dukes, archdukes, grand dukes, and emperors of Burgundy, Bohemia, Hungary, Croatia, Spain, Portugal, the Netherlands, Tuscany, Modena, Parma, and, in the New World, Mexico. Indeed, the political strategy of the Habsburgs, articulated by the fifteenth-century king of Hungary, Matthias Corvinus, emphasized the role of marriage in Habsburg dynastic ambitions: "Let others wage war. You, lucky Austria, shall marry!" (or, "bella gerant alii, tu felix Austria nube"). Of course this strategy produced some pretty complicated marital relationships, as we've seen in my posts on Habsburg women--but today we have one final opportunity, this year at lest, for seeing "lucky Austria" and Habsburg marital strategy at work. Maria Anna of Austria was the daughter of the Habsburg Ferdinand of Austria, who would become the Holy Roman Emperor Frederick III in 1637. 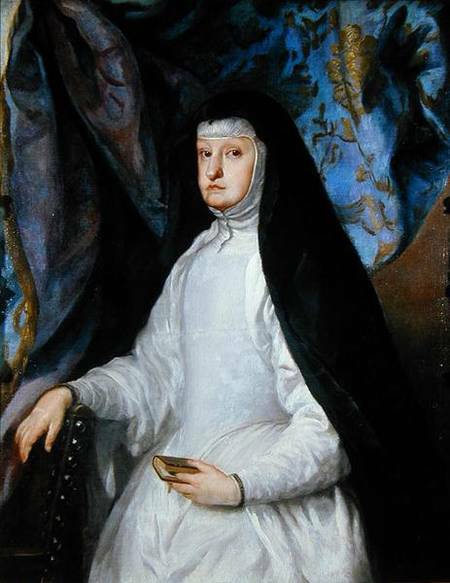 Her mother was Maria Anna of Spain, another Habsburg, the daughter of Philip III of Spain and his wife, Margaret of Austria (who was Philip's first cousin once removed). When it was time for the younger Maria Anna to marry, it was clear that her husband would of course be a Habsburg. In 1646, her marriage was arranged with her first cousin, Balthasar Charles, prince of Asturias, the son of Philip IV of Spain and his wife, Elisabeth of France (not a Habsburg). But after the prince's death just months after the marriage was arranged, a new Habsburg spouse was found for the young Maria Anna--she would instead marry the widowed father of her deceased betrothed, who was also her mother's brother. In 1649, the fourteen-year-old married her maternal uncle, Philip IV of Spain. After that point, she was known as Mariana. While the marriage was not a happy one, it nevertheless produced five children between 1651 and 1661, only two of whom survived infancy, but, "luckily," one was the male heir that Philip needed. Kept busy with childbearing and religious devotion during her marriage, Mariana nevertheless became regent of Spain in 1665 at the death of her husband. Even after her son Charles reached the age of majority in 1675, his infirmities required the queen's ongoing participation in government, though she was criticized by the council of Castile for governing with the assistance of "validos," or favorites, including her Jesuit confessor, Juan Everardo Nithard, who had accompanied the young Maria Anna to Spain to marry Philip IV, and Fernande de Valenzuela, who was suspected of having been Mariana's lover. The extraordinary dimensions of the Spanish Empire--then calculated to extend to nearly 5 million square miles--made governing incredibly difficult. In 1675, the regent fell victim to the intrigues, incapacities, and complication of the court when her husband's illegitimate son, Juan José of Austria, led a coup, took over the government of Charles II, and forced the the dowager queen to leave court. Mariana returned to Madrid in 1679, after John's death (perhaps by poisoning), but she never regained her previous authority over her son. Rivals to her influence were Charles's wives. While the relationship between Mariana and her son's first wife seems to have been fine (despite that pesky suspicion that the queen colluded in poisoning her daughter-in-law), the relationship between Mariana and her son's second wife was extremely difficult--despite the noted fertility of her family, Maria Anna of Neuburg had no children--the young queen loved intrigue, participated in exorcisms intended to release her husband from his "bewitchment," tried to amass as much money as possible, and schemed to have her nephew named as her husband's successor. 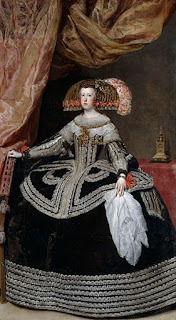 But back to Maria Anna of Austria, queen consort and regent of Spain. Despite all the intrigues and upsets, she lived a relatively long life, dying of breast cancer on 16 May 1696.